Rugby League finally comes to the App Store with Rugby League Legends! League gaming makes a retro styled comeback in this new touch based title. 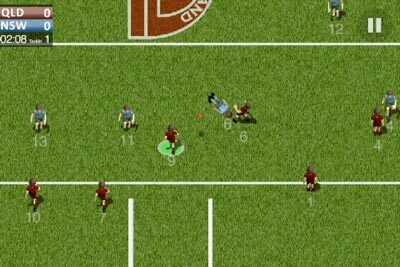 Throw wild cutout passes and desperate offloads by tapping on players. Take control of your kicking game with pinpoint torpedoes, super cheeky grubbers and cross-field high balls. Draw paths for off-the-ball players, opening up new opportunities for forward hit-ups and sneaky wrap-arounds. Grind out close fought battles or see how far you can push the scoreline. Made by League fans for League fans, Rugby League Legends brings the on-field action to your pocket. Created by Ben Johnston who purchased and adapted the RPG engine game kit!